We’d love your help. Let us know what’s wrong with this preview of Disturbing the Devil by Mike Bennett. 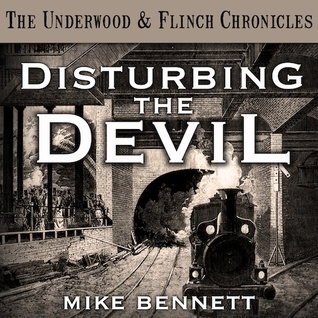 Disturbing the Devil is a journey into the smoky depths of the Victorian Undergroun February 1863, and the newly opened Metropolitan Railway is the toast of London. Among the travellers tonight are the vampire, Lord Underwood, and his guardian, Ben Flinch. But they aren't travelling alone, for Underwood and Flinch have been discovered by a group intent on their destruction. To ask other readers questions about Disturbing the Devil, please sign up. As a long-time listener of the Underwood and Flinch saga, I enjoyed this short story from Underwood's past, but didn't feel it particularly added anything to the canon. As a stand-alone it's more of an appetite-whetter than anything else. Devilishly good fun here: come join us! Mike Bennett is the four-time Parsec Award winning author of Underwood and Flinch, Blood and Smoke, Hall of Mirrors, and One Among the Sleepless. He lives in Wexford, Ireland. Mike likes immersing himself in all kinds of horror and thriller stories. He also likes traditional pubs, cooking, and ventriloquism - as long as the doll's eyes don't start following him around the room. Amazon profile (http Mike Bennett is the four-time Parsec Award winning author of Underwood and Flinch, Blood and Smoke, Hall of Mirrors, and One Among the Sleepless. He lives in Wexford, Ireland. Mike likes immersing himself in all kinds of horror and thriller stories. He also likes traditional pubs, cooking, and ventriloquism - as long as the doll's eyes don't start following him around the room.